Four soldiers died after a military helicopter crashed near a residential area in Istanbul's Çekmeköy district on the Asian side, Governor Ali Yerlikaya said Monday. Ambulances and rescue crews were immediately dispatched to Kirazlıdere neighborhood, where the crash took place. 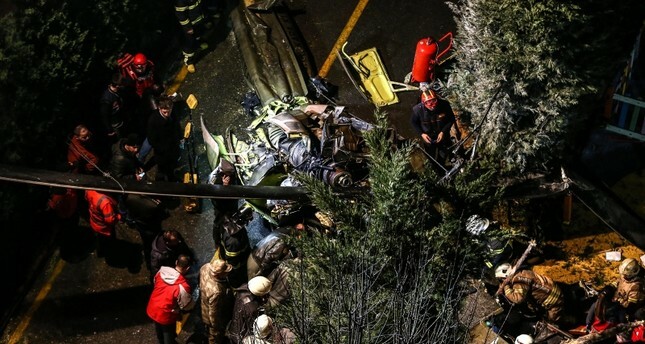 The military staff pulled from the crashed helicopter were transferred to Sancaktepe Hospital, the governor said. In a statement, the Ministry of Defense said that the UH-1 type helicopter crashed due to an unidentified reason and an investigation has been launched regarding the incident. Yerlikaya noted that the helicopter crashed inside the Parkverde Housing Complex near Sultangazi Road at 6:51 p.m. local time. Last November, another UH-1 military helicopter crashed in Sancaktepe district, leaving four soldiers dead and another wounded. Four UH-1 helicopters have crashed in Turkey between 2002 and 2011. Ten officers were killed in total in two UH-1 crashes in the northern province of Erzincan in 2006 and in capital Ankara in 2011. UH-1 helicopters, whose production ended in 1976, are widely used by armies around the world and mainly employed for training, rescue and transportation purposes.